TWO brothers were killed by more than 10 armed men inside their house in Sitio Mayana, Barangay Lalong, Calatrava, Negros Occidental Thursday, March 21. Police identified the fatalities as Lucio Agravante, 60, and his younger brother Domingo, 50. Chief Insp. Rocky Desear, chief of the Calatrava Municipal Police Station, said on Friday, March 22, that the two brothers were inside their house at 5 a.m. when a group comprising more than 10 armed men fired at them. The two brothers succumbed to multiple gunshot wounds. 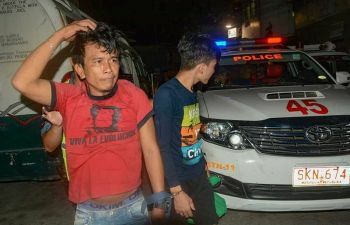 After killing the two brothers, Desear said the suspects went to the houses of Roldan Marcelo, 33, and Pedro Cortez, 41, both relatives of the victims, and took two cellular phones and P70, 000 cash. He said one of the suspects threatened the victims to vacate their place in 24 hours or else they will also be killed. Police recovered from the scene of the crime six 7.62 mm fired cartridges, one misfired 7.62 mm, two 5.56 mm cartridges, two misfired 5.56 mm, two .45 caliber fired cartridges, one .45 caliber slug and a black holster. Desear said the suspects were already identified by the victims and the motive of the incident is land conflict. He said the main suspect of the incident employed gun-for-hire men to kill the two brothers.